The subdued nature of the celebrations which followed Ardnasool Jet’s win in last year’s Bar One Irish Sprint Cup final at Dundalk Stadium was perfectly understandable. Connections had suffered a bereavement during the course of the event, a member of the team preparing the dog dying at an all too young age, and emotions ran high. That was last August. Seven months on and the Lifford contingent was back on the podium last Friday night, once again surrounding one of the great sprinters of our time. Ardnasool Jet’s repeat win was history in the making, the Donegal Dynamo becoming the first to win the country’s short-distance Classic more than once. There were smiles to accompany the presentation of trophies to the McGhee family by sponsor, Barney O’Hare, and his wife Tracey, and the young man wasn’t forgotten. In keeping with many Sprint Cup finals of recent years, this renewal was a thriller, the camera having to be called upon once again to sort out the finish. Crokers Hill made it home with just a half-length to spare in 2014, and then 12 months later, Slipalong Hero prevailed by only a head, Hillcroft Hero the runner-up. Brian and Laurence Jones’ Heisman had the same margin of victory in 2017, and last year Ardnasool had it even tighter, the minimum margin dividing the then raw recruit and Broadstrand Kiwi. Ardnasool Jet wore red in defence of his title, just as he did last year. He headed the betting, just shading his main danger, Cabra Hurricane, who was housed next door. Another top fancy, Cronody Tadhg, was in three. Doubts surrounded Cabra Hurricane’s participation after he had shipped an injury in the semi-finals. But the Thurles-owned dog was got ready in tip-top shape by trainer, Patrick Guilfoyle, and ran a blinder to take the runner-up spot. Cronody Tadhg was third, and with the sextet finishing in racecard order, Doona Buck filled fourth spot, Lugs Branno fifth, with rank outsider, Boleys Fella, the whipper-in. The 2018 sprinter of the year, having added the Night of the Stars sprint to his Dundalk success, Ardnasool Jet was led out by Cronody Tadhg, but within 50 yards was in front, perfectly placed along the rails. Cabra Hurricane went second on the run to the bend, and at this point it was clear the finish would rest between the two principals in the betting. A lead which at one stage stood at two lengths was reduced with every stride as Cabra Hurricane got into top gear in the home straight. But Ardnasool wasn’t for catching. Roared on by his supporters, the son of Droopys Jet and Kilara Jade defended his lead all the way to the line, finishing with a half-length to spare. It was just over four lengths back to Cronody Tadhg. The time, 20.97, was the second-fastest in the 16 runnings of the final and Ardnasool’s best-ever for the 400. This was only the Dynamo’s 17th race, and his record reads 12 wins, two seconds and three thirds. In other words, he has never been out of the top three; at the time he put a couple of placed efforts together he was troubled by injury. Cathal McGhee, training for his brother Adrian, had the dog in great order. He said the plan is to take the champion for a trial in Sheffield with the possibility of running him there in the Northern Sprint. A move up in distance is not being considered just now, but trainer McGhee didn’t rule it out happening some day. What he’d love to do is come back to Dundalk to make a bid for the three in-a-row. Regardless of whether or not that challenge materialises, Ardnasool Jet has earned himself a place in the history book as the only dog to do the double. Cambusmore, the 2012 winner, reached the final the following year but wasn’t a factor in the race won by Razldazl Rioga, and an injury-plagued Heisman couldn’t reproduce 2017 form last year. 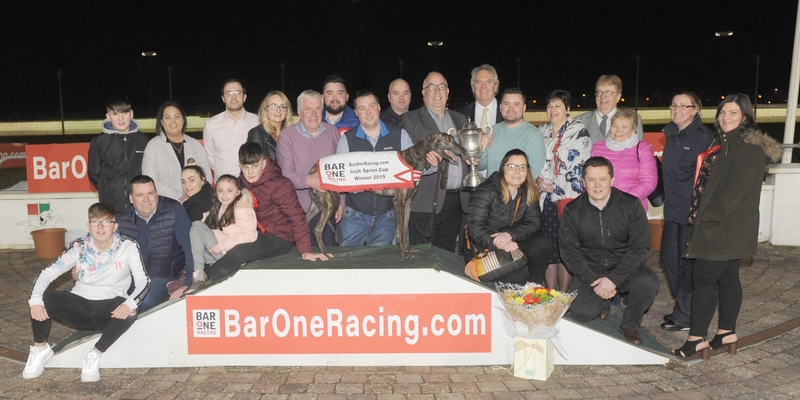 Connections of Blame The Game were left to ponder on what might have been after the Belfast-owned dog scored an emphatic win in the consolation final. Running in the main competition’s semi-final the previous week, Blame The Game met with interference early in the home straight, and having had the look of a winner about him, was run out of the qualifying spots close home. Martin Lanney’s Meath-based charge was drawn in five to gain some compensation, and after getting away with the others showed a devastating burst of speed to reach the bend in front. He went on from there to open up a huge gap, clocking just eight spots off from his best-ever for the distance, 21.10. Blame The Game enhances trainer Lanney already fine record in this competition. The Meathman has had six finalists in the main event, winning with Johnny Gatillo and losing twice in photo-finishes, with Forest Natalee and Cloughtaney Gift. Gatillo came back to win the consolation final. There were four graded finals on the support card, the first of them going to the impressive Michael Kelly- trained Boulevard Mist. Leading from early on, the daughter of Skywalker Puma confirmed semi-final running, winning unchallenged over the 525 in 28.59. Kelly was sponsor of the Jonathon McKenna Memorial, and victory here went to the Laurence Jones-trained Kokoda, who prevailed in a tremendous tussle with David Hoey’s Mystic Raider.